Should Pregnant Women Take 4 000 IU of vitamin D3 a day? Well, that depends on a number of things, e g, what their blood serum level of 25(OH)D is at the start of pregnancy. Let’s look at an interesting new study where women received supplements of three different doses; 400 IU (current recommendation), 2000 IU and 4000 IU, respectively. All women had dangerously low levels at 12-16 weeks gestation, when the study started. Recent studies have shown that vitamin D deficiency during pregnancy is a serious public health issue. ”Diet doesn’t provide enough vitamin D, and we don’t go in the sun as much as we need,” Dr. Wagner said. Therefore, she and her colleagues set out to determine the optimal dose of vitamin D supplements for pregnant women without doing harm. Researchers randomized 494 pregnant women at 12-16 weeks’ gestation into three treatment groups. Group one received 400 International Units (IU) of vitamin D a day until delivery; group two received 2,000 IU and group three received 4,000 IU. The women were evaluated monthly to ensure safety. ”No adverse events related to vitamin D dosing were found in any of the three arms of the study,” Dr. Wagner said. Investigators also looked at the effects of vitamin D supplementation on complications during pregnancy, including preeclampsia, gestational diabetes, infections, and preterm labor and birth. ”The spectacular part of the study was it showed women replete in vitamin D had lower rates of preterm labor and preterm birth, and lower rates of infection,” Dr. Wagner said. The greatest effects were seen among women taking 4,000 IU of vitamin D per day. Therefore, the researchers recommend this daily regimen for all pregnant women. This study corroborates recommendations by other researchers of daily doses of 5000 IU or more, for both men and women. Calcium levels as well as other markers were measured during the present study to ensure safety at the higher doses. No adverse effects were observed, again in agreement with previous studies were no harmful effects have been observed even for doses up to 10 000 IU per day. The average person starts to store cholecalciferol (D3) at 40 ng/ml, but at 50 ng/ml virtually everyone begins to store it for future use. That is, at levels below 50 ng/ml, the body uses up vitamin D as fast as you can make it, or take it, indicating chronic substrate starvation—not a good thing. 25(OH)D levels should be between 50–80 ng/ml, year-round. For comparison, do take a look at the Disease Incidence Prevention Chart over at GrassrootsHealth. 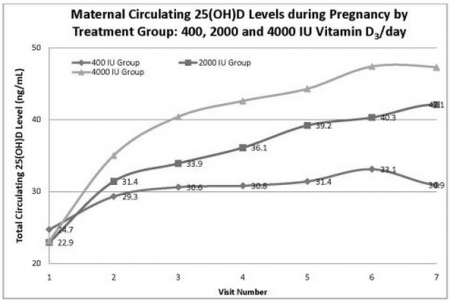 So, yes, pregnant women should take 4000 IU of vitamin D3 during pregnancy, but probably more, and preferably always. But 4000 IU is what has been studied so far. The results of the present study are very encouraging and there will be more studies for sure.